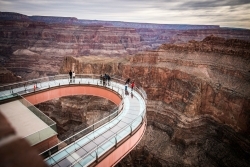 Grand Canyon West, owned by the Hualapai Tribe, is not connected in any way with recent news stories regarding uranium exposure at Grand Canyon National Park -- which is located across the state of Arizona, more than 100 miles away. Peach Springs, AZ, February 20, 2019 --(PR.com)-- Grand Canyon West is not connected in any way with recent news reports regarding uranium exposure at Grand Canyon National Park. Grand Canyon West is owned and operated by the Hualapai Tribe and is not part of Grand Canyon National Park. There is no relationship between Grand Canyon West and Grand Canyon National Park. The location of the museum where the uranium ore was stored at Grand Canyon National Park is more than 100 miles away from Grand Canyon West.